The Cathedral of the Pines is a holy place without walls. People from all beliefs are welcome to worship and seek spiritual renewal. The cathedral floor is the pine forest, and the pews are benches in the outdoors, the altars and pulpits are made from fieldstone. Originally part of “Interlaken” farm the property was owned by Douglas and Sibyl Sloane. Following the death of their son Sandy during World War II (Lieut. Sanderson Sloane, a bomber crewman, was shot down over Germany) prompted them to create a memorial. The response of family and friends caused them to turn a private chapel into a public open-air cathedral. Reportedly their son had planned to build his home on the site of the current cathedral. Apparently the “cathedral” is much older than first thought. Although the “official history” on the cathedral’s web site does not mention it, I found an 1899 reference, when Mary Baker Eddy Wrote in the Christian Science Sentinel,”The open-air amphitheater called the Cathedral of the Pines, in Rindge, New Hampshire, is a beautiful spot with a view of lakes, forests and distant mountains…. outdoor cathedral…” On Sunday afternoon, August 16, at 3 o’clock, a Christian Science service was held there. Open from May to October, reportedly over fifteen millions of people have visited the Cathedral, both from the United States and abroad. 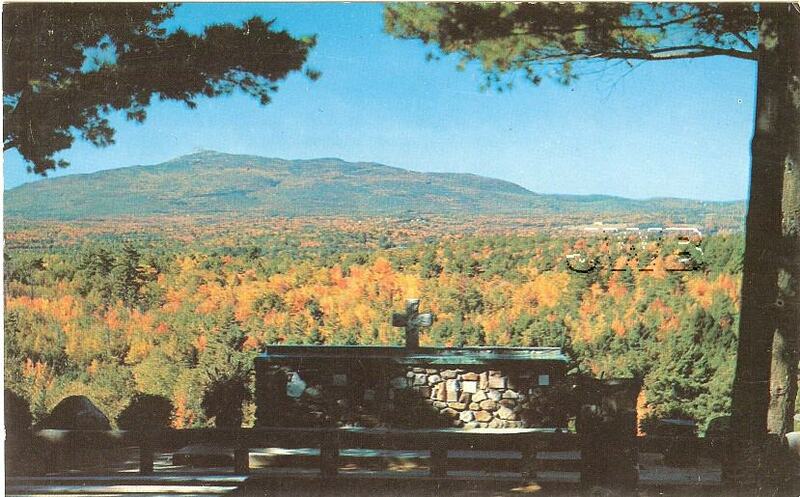 Part of a larger memorial of over 200 acres, the Cathedral of the Pines is located near Grand Monadnock. Located here is the Altar of the Nation, a memorial to all American war dead, designated by a unanimous vote of the United States Congress. The stones making up this altar come from every state and territory in the United States, and include a stone donated from every U.S. President since Harry Truman. Another shrine, the 55-foot stone Women’s Memorial Bell Tower, is the only monument in the United States to specifically recognize America’s patriotic women who died while serving their country. Norman Rockwell created the drawings of the woman displayed on its bas-relief tablets. Formerly on the grounds of the Cathedral of the Pines was Cathedral House, a year-round bed and breakfast in a refurbished 1850s farmhouse [note: this is now closed]. New Hampshire is not alone in having a “Cathedral of the Pines.” Another similarly named location exists in Lutsen MN. This entry was posted in History, Structures, Travel and tagged 2, Altar, Altar of the Nation, American, Bell, Bell Tower, Cathedral, Congress, dead, died, Hampshire, Interlaken, memorial, nation, new, New Hampshire, NH, Norman, patriotic, Pines, Rindge, Rockwell, Sandy, service, Sloane, stone, swerving, tower, two, U.S., United States, war, women, world, WW2. Bookmark the permalink.